French WIND magazine likes the board for its “liveliness” and because it “offers radical rides in all types of conditions”. And British WINDSURF states that the “carving flow and response seem almost supernatural” and “in clean cross-offshore conditions, it was simply a revelation”! Morgan Noireaux sailed a Radical Thruster Quad to win the only true down-the-line PWA wave event –the Aloha Classic– two years in a row. The deep double concaves in the bottom are the distinguishing shape details of this design. Their deepest parts sit right under the straps creating long flat planing sections. Together with the wingers –which slightly widen the planing surface– these concaves enhance acceleration to a surprising speed. You’ll enjoy the lively and “light” feel based on the very short wetted planing area. The Vee cushions the ride and creates a well rounded bottom curve at the rails. As a result, the board turns tight easily offering ultimate rail bite. It instantly responds to every little input from the rider. The inexperienced wave rider will consider the board’s speed of reaction as nervous, while the targeted, advanced wave rider will love this liveliness, just as much as he will adore the super fast change from rail to rail. The Radical excels in side to side off-shore conditions and keeps getting better and better, the stronger the wind and the bigger the waves get. Its strength? Firstly, it is the feeling that there would be absolutely no limits for radical riding. And secondly, the excessive amount of speed it can carry into the bottom turn in total control, remaining all time ready to smoothly adjust the turn in order to hit the lip where wanted at maximum pace. The boards come with the proven quad fin setup enhancing the grip and drive in fast wave carves. The rear center fin box for a thruster setup can be used for more power in light or side shore conditions or for more control in real big waves – currently Jason Polakow’s favorite setup for big waves and Antoine Martin’s favorite setup for European PWA events. >> According to our pro riders unmatched for real down-the-line wave riding! You’ll be blown away by your high speed carving top and bottom turns. 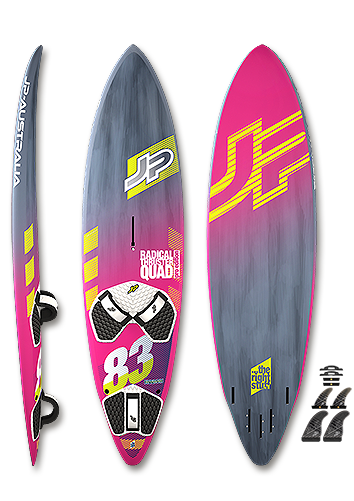 The board provides all the needed grip, control and liveliness throughout your wave moves. It rewards an active riding style with turns that you used to dream of. Every advanced waverider will simply love them as they take his riding to the next level. The boards additionally come with plugs to cover all fin boxes.